How often when driving do we see defaced road signs preventing us from knowing which way to turn? Do these idiots not realise that in causing cars to slow down and brake because they don't know how to proceed thay may actually kill people? This really is one of the most stupid examples of graffiti damage anywhere. 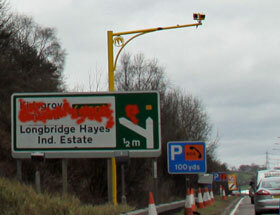 Defacing road signs not only angers drivers but can also cause accidents. The reason road signs are there is to ensure that traffic runs smoothly and everyone knows what they are doing and in effect to prevent road accidents. These graffiti artists must have been taking lessons in stupidity because what other possible reason could there be for spray painting over a road sign? Defacing a road sign showing a speed limit rendering it unreadable is not only dangerous but could also result in motorists being fined for speeding because they are not aware what the speed limit should be. Replacing defaced road signs costs the Councils money and in turn the tax payer. In some areas people are not only defacing road signs but also removing them and melting them down to sell as scrap. People wonder why their council tax bills are so high in Britain - this is one reason, graffiti artists are stealing our money.